﻿ Work in Process (WIP), What is WIP? Work in process (WIP) Inventory . Most non-accountants (and some accountants) think of work-in-process as a description of the physical state of inventory in a manufacturing operation. For example, you have something on the shop floor that you've done something to, but you still have more things to do to it before it is a finished item. If it weren’t for computerized MRP / ERP inventory systems and accountants, that simple description would probably hold true. The reality is work-in-process (WIP) has two different meanings. One that describes the physical state of the inventory, and another that describes an account used to track the value of work-in-process. And this is where the confusion starts. You would think that the inventory we describe as WIP based on its physical state would be the same inventory represented by the WIP account. But that would be too easy. The WIP account represents the value of materials, labor, machine time, and overhead reported as consumed to produce something that has not yet been reported as completed (It’s actually a little more complicated than this, but I’ll get to that later). Okay, you say, but that still sounds like the value of the inventory we call work-in process based on the physical state. The big difference here relates to “reported as consumed” and “reported as completed”. Whether something is reported as consumed or reported as completed has to do with the bill-of-materials (BOM) structure, the transactional methods being used, and the procedures related to when and how things are reported. How BOM structure affects WIP. Let’s say we’ve got a little operation that makes ceramic coffee mugs with clever little sayings on them. Let me first say I don’t really know much about making pottery so please don’t email me if my descriptions are not technically correct. Now back to the example. We start by mixing the clay from our special recipe of raw materials, and then we form the clay into mugs, let them dry, and fire them in the kiln. We then apply our clever little sayings on them with glaze and throw them back in the kiln. Now we have our finished mugs. If our bill-of-materials and routing is set up such that the raw materials that go into the clay, the glaze, and all the operations required to product the finished mug are on one BOM (and therefore everything is produced using a single production order), everything we touch in the process is considered to be WIP up until the finished product is completed. Therefore, the mixed clay, the formed mugs drying and awaiting the first kiln firing, the fired mugs awaiting glaze, and the glazed mugs awaiting the final firing, are all part of WIP—or, more specifically, the value associated with these items is part of WIP. However, if we have one BOM to create the clay, another BOM to turn the clay into unglazed mugs, and another to turn the unglazed mugs into finished glazed mugs, things are a bit different. In this scenario, the mixed clay and the unglazed mugs are no longer part of WIP. That’s because once you’ve finish mixing the clay, you report the clay as completed on its own production order. It now exists as an inventoried item (Clay). And once you’ve formed the clay into mugs and fired them in the kiln, they are no longer part of WIP because you will report the unglazed mugs as completed on their own production order, and they will now exist as an inventoried item. Under this scenario, the clay being mixed, the formed mugs waiting to be fired in the kiln, and the mugs that have been glazed and are waiting to be fired in the kiln are part of WIP. That is because they have been changed from their inventoried state (either clay or unglazed mugs in this case) but are not yet completed to another inventoried state. To clarify “inventoried item” and “inventoried state”, this represents items that can be tracked in your perpetual inventory system. This means they have a unique item number (SKU number) that is associated with that item in that state. And that your “inventory system” (your computer) tracks quantities associated with these items. Therefore, you should be able to inquire into your inventory system to see how many of that specific item you have in stock. So, based on the 2nd WIP example previously covered, we would have a unique item number for the “unglazed mug” that is tracked in our inventory system. When we complete production of the unglazed mugs, we enter a transaction that puts the unglazed mugs into stock. Whereas in the 1st WIP example, the unglazed mugs do not have a unique item number and are not put into stock. They instead remain part of WIP. To put it another way, you can think of the WIP account as means of tracking the value of inventory that is in a state that is not set up to be tracked in the perpetual inventory system. It is essentially a necessary compromise (some may say necessarily evil) used to maintain the integrity of the accounting system without creating insanely complex levels of inventory tracking. What if I want to track the value of the unfinished "inventoried items" AND the stuff in the WIP together? This is actually very common. Businesses like to classify their inventory to better understand where their inventory investment is, and the executives really don't want to hear about the nuances of how the bill-of-material structure affects what is being reported as "work in process". Most business accounting systems will allow you to set up multiple inventory accounts. All you need to do is set up an inventory account called "unfinished goods" or "in process inventory", then attach all unfinished inventoried items to this account, and make your WIP account a subaccount of this account. How transactional methods and procedures affect WIP. The bill-of-materials structure helps us to understand in theory what is and is not part of work-in-process, but in order to fully understand the WIP account in practice, you also need to understand your transactional methods and procedures. Remember earlier when I mentioned the importance of “reported as consumed” and “reported as completed” with WIP. In theory, things are reported as consumed when they are consumed, and reported as completed when they are completed. In practice however, the timing of these transactions can vary significantly from the physical activities associated with them. For example, if I choose to have material handlers pick raw materials from storage based on the needs of specific production orders, deliver them to the work station, and issue the materials to the production orders at the same time. These raw materials are now part of WIP even though nothing has been done to them other than physically moving them to the workstation. They may sit around for days or weeks in the staging area and physically be no different from the raw materials in the storage areas, but they are part of WIP because we already did the transaction. If however, I choose to not have the material handlers issue the materials (they would still deliver them), and instead use backflushing transactions to issue the materials when the machine operator reports production, then these materials will not be part of WIP when they are staged, or even after they have been physically consumed assuming the backflush transaction has not yet been done. Read my article on Backflushing to get a better understanding of these types of transactions. And then there’s stuff like labor and overhead. Remember, WIP is an account used to track the costs associated with production of goods. Materials consumed in production is only one part of these costs. We are also often tracking costs related to labor, machine run time, and overhead. Exactly what you track depends on how you set up your manufacturing system, but these costs can have a significant impact on the WIP account and can help to demonstrate why thinking of WIP as physical inventory is problematic. For example, if I’m producing an item on a machine that requires extensive setup for each production run, I will have labor and possibly machine and overhead costs associated with this setup. When I complete the machine setup, I will report labor and other costs (enter them into the computer system). At this point in time, these costs go into the WIP account even though there is nothing physically existing to associate with these costs. Let’s see how we can use costs to make WIP even messier. Earlier I said “The WIP account represents the value of materials, labor, machine time, and overhead reported as consumed to produce something that has not yet been reported as completed.” Since then, you’ve seen how this is more complicated than it sounds, and now it’s going to get really ugly. That’s because how we “value” inventory can sometimes create problems. If we ran on “actual cost” the WIP account would be stay rather clean (in theory). That’s because when we report the production of the finished item, the system will take all those costs that went into WIP and use those to calculate the value of the finished items being reported. 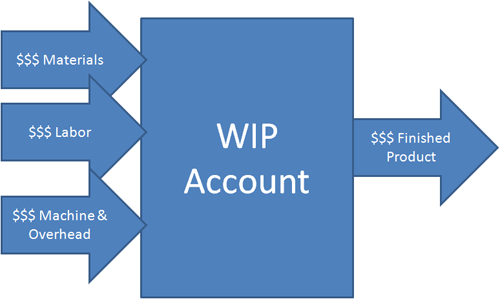 Therefore, the value taken out of the WIP account when you complete a production order will equal the value that went into WIP to produce that order. The problem is, many businesses do not use actual cost for their finished goods (and for good reason, but that would be another article). They instead use something called “standard cost”, which is the calculated cost of the finished item based on the “expected” costs. However, they often use actual costs to report into the production process (actual labor and machine time, and sometimes the actual labor rates of the specific individuals performing these tasks). Since the actual costs to produce something never exactly match the expected costs, you will always have variances in the WIP account because the value of goods produced coming out of the WIP account does not exactly match the value of materials, labor, machine time, and overhead going into the account. On the surface it may sound stupid to use standard cost to value the finished product yet apply actual costs to the production, but there are valid reasons for this. It basically comes down to wanting to track actual costs associated with production without having the variability of the actual costs associated with individual production runs (and production-reporting errors) affect the cost of the finished items. And this brings us to “WIP variances” and how to count and reconcile WIP. >>>Go to next page of article.